Beauty, Grace and elegance- The White Freshwater Earring Set is a magnificent piece. 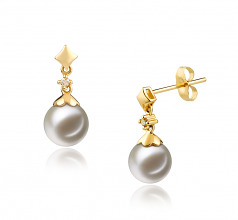 The earrings feature the 14K yellow gold figure – that appears to be one of a high status or power. The figure holds within the heart a diamond accent as the dress covers the top of the elite and guarded White Freshwater Pearl. 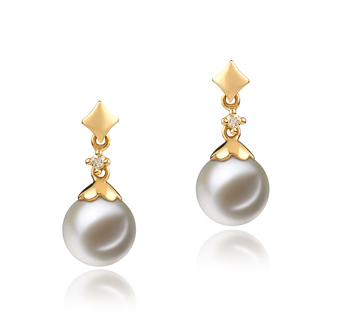 Each Pearl is a generous 7-8mm in size and glistens with a (AAAA) mirror like luster that compliments the 14K yellow gold. The (AAAA) perfect round sphere of the pearls shows thee honor of the guard in treasure. They are a work of perfection. This set is one to be worn as much and as often with a casual, business or formal line, the one “figure will stand guard”.